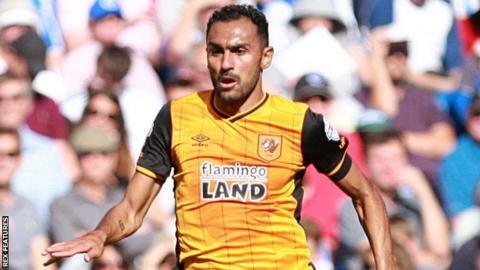 Hull City full-back Ahmed Elmohamady has signed a new three-year deal with the Premier League club until 2019. Egypt international Elmohamady joined Hull on an initial loan deal from Sunderland in 2012, before signing for £2m fee the following year. The 28-year-old made 51 appearances last season to help City earn promotion through the Championship play-offs. "I took the decision to sign straight away, it wasn't difficult," he told BBC Look North. "We have a great manager, an experienced manager who's been in this league a long time so he knows how to prepare us for the big games. "Hopefully we'll get the right people and the right players to go back and do well in the Premier League." Elmohamady's contract is subject to him being granted a new work permit. Read more on Premier League fixtures: Who are your club playing next season?